Longspur: A weird blend of pop-punk, metal, rock, and just about everything in between. Longspur: We’ve always been really big on our live shows. We give a lot of energy and stage presence and try to provide an intimate setting where people can loosen up and have fun and interact with the band as much as possible. We also try to change up things from the CD version as much as possible so that people can experience something new. AX: Who are some of the band’s biggest influences? AX: What’s the history behind the band? How did you all get together? AX: What sparked your interests in the music industry? Was there a particular event or person that made each of you decide to get into music? Longspur: We’ve always just been huge fans of music in general and the thought of being able to do something you love for a living has always amazed us and given us something to strive towards. We all love going to shows, and being able to play them on such a frequent basis is the best thing we’ve ever been able to do. AX: What do you hope people can take from you music? From your live shows? Longspur: Our whole goal when writing this record was to provide all kinds of different people with something they can enjoy no matter what kind of musical tastes they have. We want to appeal to everyone we can possibly reach out to. At live shows we just want people to have a good time. AX: What makes Longspur different than other bands in your area or genre? 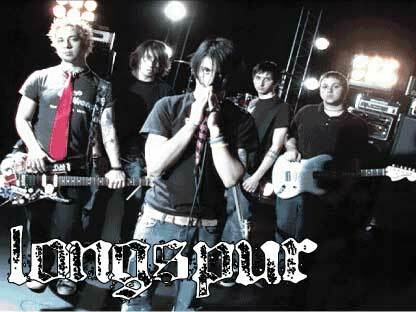 Longspur: We try to blend together a whole lot of different genres and influences in order to come up with something new that really can’t be compared to any other bands. It’s cool because there’s a whole lot of energy and aggression but at the same time it’s all based upon melody and hooks. AX: Where do you see this project taking you? Or where would you like to have it take you? Longspur: We plan on following this as far as we possibly could. We’re totally stoked about how far we’ve come already and we really put our everything into this band, because if we could we’d love to be able to support ourselves and make a living playing music. AX: Where can people find out more about the band and pick up you CD and merch? Longspur: You can check everything out at www.Longspur.com, www.Rockoutrecords.com and www.myspace.com/longspur. Thanks to anyone who checks us out!! !